Poson Poya is a most revered festival for the entire Buddhist population of Sri Lanka as it reminds us of the advent to Sri Lanka of Arahat Mahinda with Buddha's message of the Dhamma. Celebrating this historic, two thousand three hundred and eighteenth Poson Festival in unity with the entire nation brings us great joy, states President Mahinda Rajapaksa in a Poson message. The Dhamma preached by Arahat Mahinda led our society and culture to a new path. It showed us the way to live in co-existence as citizens of one country regardless of ethnic or religious differences. Inspired by the spirit of loving kindness and compassion, we resolved as a nation to build a society based on morals and non-violence. It was due to the path of peace and serenity enunciated by Arahat Mahinda that we lay claim to a proud history among the countries of the world. 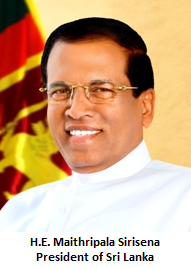 The country, today, is united to build a righteous nation based on the teachings of Arahat Mahinda. Success must be achieved by working resolutely. Based on love and kindness we usher in co-existence. We should not forget that the divisions make us the losers. Our State policy is always guided by the path of Dhamma. Let us reflect upon these words of the Enlightened One taught to our nation by Arahat Mahinda which means 'One who lives with the Dhamma is protected by the Dhamma' and make the Poson season more meaningful by aligning ourselves to build a New Sri Lanka.